Demand Pack #1 is an expansion pack that comes with 16 new cards that will add new major demands for the original abductors (Arkayne, Donna, and Edward) as well as the abductors from Abductor Packs 1-4 (Connor, the Pedersen Twins, Lt. Jackson, and Herrera). These cards will breathe new life into abductors you've faced off against before. 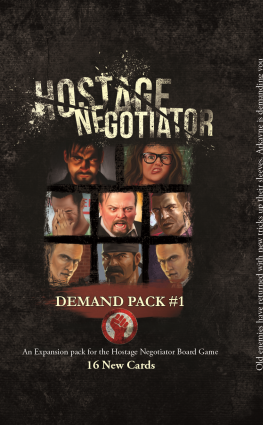 Demand Pack #1 was a stretch goal that was achieved in the Hostage Negotiator: Crime Wave Kickstarter campaign.